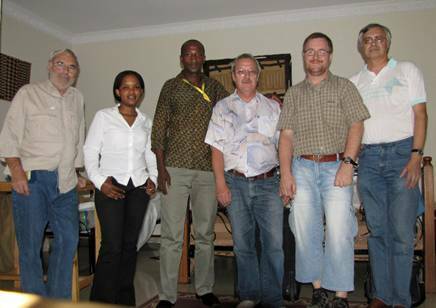 Sigi, DL7DF, Wolf, DL4WK, Frank, DL7UFR and Rolf, DL7VEE were QRV from the evening of the 26th October to the morning of the November 2nd as 9X0SP from the Golf Hills Residence in Kigali. We were running two stations with K2-transceivers and almost 500 watt amplifiers. We used a Spiderbeam for 20 – 10 m and three vertical antennas. 8529 QSOs were made in CW, SSB, RTTY, PSK and one in SSTV. Conditions on 160 m and on 6 m were rather poor and didn’t allow any QSO. The second part of our expedition started at the evening of the November 3rd until the morning of November 9th as 9U0A from the Hotel Club du Lac in Bujumbura. 13155 QSOs were logged from here. As we had some more place for antennas we used the Spiderbeam and 5 other verticals/loops. This was a high expense for only four persons. For 160 m we had an inverted L-vertical with 18 m heights. We tried every night but 160 m seems to be very poor and most of the nights the QRN level was high. Anyway, we enjoyed it very much and so we thank you for so many QSOs. 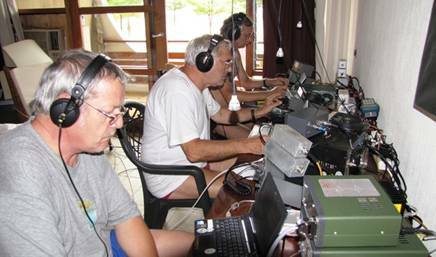 Together we registered nearly 22.000 QSOs in 11 days activity. QSL via DL7DF direct or bureau, later we will give the QSOs to LOTW. Colour QSLs are already ordered.